Of course, you don't have to use all ten herbs, and you can vary the quantities to suit your taste, or add herbs you may have growing in your garden. However you make it, thick slices of this aromatic blend are delicious on grilled fish or steaks, spread on large mushrooms before baking or stuffed under the skin of a chicken before roasting. You could even stir it into hot pasta for an instant supper, or spread it on discs of baguette and bake to create herby crostini. Put all the ingredients in a food processor and blend until well combined, scraping down the mixture from the sides of the processor bowl a few times as you go. Tip the butter out on to a sheet of clingfilm. 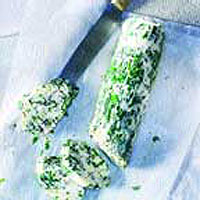 Shape the butter into a long sausage, using the clingfilm to help you, then transfer to a sheet of greaseproof paper. Roll up tightly in the paper, folding over the ends to seal. Chill until firm, then slice to use. Keep for up to 4 days in the fridge. This recipe was first published in August 2004.